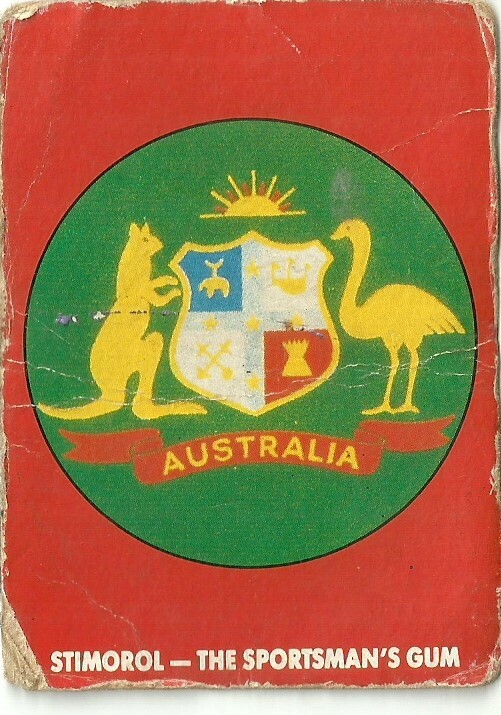 The appearance of the battered red and green card on top of the deck, looking a lot like Steve Waugh’s latter day baggy green cap, is enough to bring back strong memories of the 1990-91 summer. There were 84 to collect, sold in packs of five, with the ever-present powdered strip of Stimorol – The Sportsman’s Gum – duly dusting up the wrapper. The best thing to be said for the chewie is that you never would have bought it without the cards, which I picked up for twenty cents a pack at the Louth Park Corner Shop. In those simpler pre-IPL and Big Bash days, the Test series started at the Gabba on 23 November, with the final match finishing in the first week of February – the Benson and Hedges World Series being played in its entirety in between. 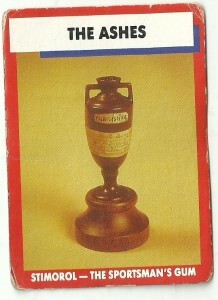 With a schedule like that it would have been nigh on impossible for the Australians to achieve the sort of results they have in the current summer, where they remain undefeated: playing to a 1991 schedule would have seen them only three test matches completed, with the one day tournament finished – the closest thing to a T20 match in those days being the annual ten over comp we used to play in Maitland. The single biggest reason for the recent increase in four and five-nil series defeats for away teams is probably that change in the scheduling. Winning streaks and losing streaks are much easier to maintain if you have no time in between matches, and just keep on playing in the same format – the momentum building with each result. It also makes blogging harder. More than once in the series just gone, I had put off until tomorrow what should have been done today – only to find that the Aussies had again rolled the Poms easily in the ensuing hours. But that isn’t such a bad problem to have for an Australian cricket tragic of my generation. Blokes from Down Under who came of age in the 90s – and eight Ashes Series wins in a row – have the inverse problem that the Englishman Lawrence Booth complained about in his book, Cricket, Lovely Cricket? For him, 2005 was the first time he had watched his team complete a series victory, whereas the previous 16 years had led me to think of Australia winning the Ashes as our Divine right; when England won it was an aberration – when Australia did so, it was meant to be. It was the same in my one-on-one backyard games with Dan Johnson, except I played the role of the Poms to his Australia. We took ourselves a little too seriously, and after our first match burnt one of my bails with a Bic lighter before converting a used Chinese takeaway container for our urn. Having had a few more years of competitive cricket under his belt, and a devotion to the dour batting of Geoffrey Boycott, Dan was all over me in our inaugural series. I could win individual sessions, but game after game, he stonewalled me in impressive fashion, to the point where he announced, after another convincing victory, that I would never beat him – an unwise choice of words in a two horse race. The inevitable happened in that season of 1990-91. The only game I beat Dan in ended up being one of our last, not unlike a match against my Dad during the same period. It was then that I realised that the friendship with Dan was not one of two equals, but one in which the inferior cricketer was supposed to admire the superior, and provide a good contest – but never to win. He was a strange cat; besides his devotion to Boycott, he loved Freddie Mercury, Sid Vicious and the Yorkshire Ripper. 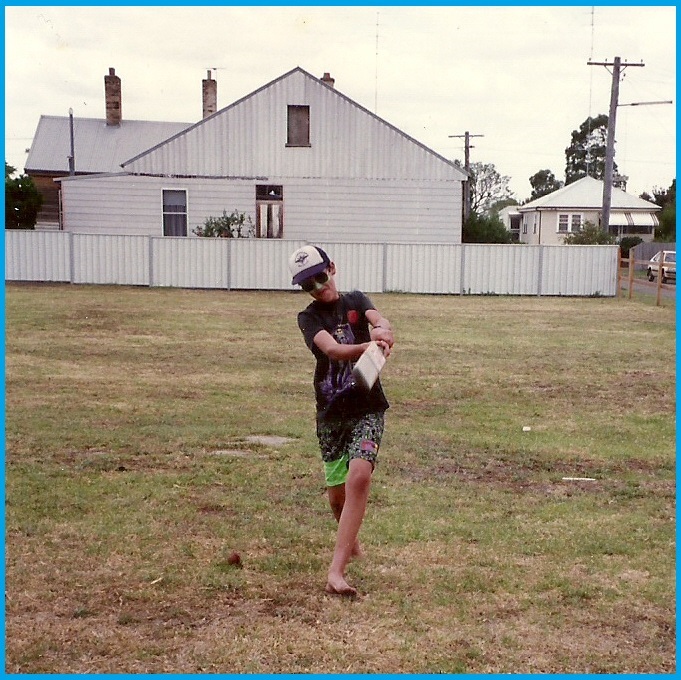 Dad, on the other hand, a fan of disco, simply moved me on to pool and darts – two fields where he can still towel me up today. Twenty-three years later, Dan has moved on to Law, I’ve moved to India, Dad still loves his Earth, Wind and Fire, and the Ashes are back where they belong – for now.